Our dedicated team of spinal injury solicitors and experts are ready to take your call now for a no-obligation discussion, with specialist advice about how to make spinal injury claims. We work on a no win no fee* basis, so your route to spinal injury compensation comes at no risk to you. Call Now on Freephone to Start Your Claim – If you would like to talk to our spinal injury solicitors about making a spinal cord injury claim for compensation, then please telephone our Freephone number, or use our email form for an immediate no-obligation call-back. We work on a no win no fee* basis and work to secure spinal injury compensation as swiftly as possible. Spinal Injury Compensation: How Much Can You Claim? In our professional experience, our solicitors and lawyers state that compensation for spinal injuries will typically be a lot more than your average personal injury claim, due to the unique and debilitating nature of spinal nerve damage and spinal cord injuries. When we process your spinal injury claim for compensation we take a number of factors into account. This includes items such as how much pain and suffering you have endured, any medical costs, future rehabilitation costs, how much will need to be spent on nursing and disability aids, any forms of equipment that needs to be purchased as well as loss of earnings for your and your family. Loss of earnings is particularly important if you are in the situation where you will not be able to return to work due to a spinal injury. Our spinal injury solicitors are extremely experienced in dealing with spinal injury compensation claims. We advise that you only ever deal with a lawyer, like those at our disposal, who are well-versed and practiced in spinal cord injury claims. A spinal injury claims solicitor will work with you to recover as much money as possible for you when it comes to getting the compensation that you deserve. Our lawyers and solicitors have been responsible for settling cases that range from one hundred thousand pounds up to the millions. If you have not yet taken action, then we implore you to call us today so that we can start your spinal injury claim as soon as possible. The longer that you leave it the more difficult it gets to claim the full amount of compensation that you are due for your injuries. Why Make a Spinal Cord Injury Claim? If you, or someone in your family has had an accident that has resulted in an injury to their spine, then it can be a defining and life-changing moment. Everyday tasks and activities can be severely impacted, or in the worst case scenarios can become completely impossible. If a third party was to blame for your spinal injury, then you should be looking to claim for compensation. We won’t lie and say that a monetary pay-out is going to make everything better, but it will at least make your life and the life of your family and carers much easier. What Will the Compensation Be Used For? By claiming for spinal injury compensation, and winning the case (which our solicitors and lawyers are experts at doing, with an excellent track record) then you can benefit from the following when you receive a compensation pay-out. Call us today, and let our spinal personal injury solicitors assess your case. We will be able to advise you very quickly as to whether you are one of the many people in the UK eligible to make spinal injury claims. With many people suffering from spinal cord injuries due to road, work, and sporting accidents, you are not alone, and we will make sure that you get the support that you and your family need to recover, or maintain your lifestyle due to spinal nerve damage or longer-lasting injuries. When you call us, we will assess your case as an individual, then if valid, will refer you to an expert and specialist spinal injury claims solicitor. Our team work extremely hard and diligently to ensure that our clients receive the maximum amount of spinal injury compensation possible. We have successfully claimed spinal injury compensation via our claims team for hundreds of people just like you or your family members around the United Kingdom. Our spinal injury solicitors will work to make sure that you receive the best in medical care and support so that you can start to think about your future, and that of your family. We work with the leading UK associations that are set-up to support and rehabilitate sufferers of spinal cord injuries and nerve damage (please see our related links at the bottom of this page for more information – we also specialise in brain injury compensation claims). Making spinal injury claims is relatively straight-forward when you use as your legal representation. We listen to what happened to you, gather evidence, talk to witnesses, and develop the best and most watertight legal case designed to get you the most compensation possible. We communicate with you each and every step of the way so that you know exactly what’s happening at all times. Essentially though, we do all the hard work from a legal perspective, so that you can concentrate on your recovery process. If you decide to call us and let us represent you for your spinal cord injury claim then this is a brief overview of the process involved, and how you will benefit from our expertise. Due to the serious nature of spinal cord injuries, we work very closely with our clients, as the personal injury compensation process can be different to standard cases. We like to communicate closely with your family members or primary carers, and might on occasion need to come and visit you at your home or in hospital. Choose us as your preferred spinal injury lawyers. We are a friendly and reputable team who put the needs and requirements of our clients first. Call us today for a free and no-obligation discussion about your potential spinal injury claims compensation. Also known as an SCI, spinal cord injury refers to damage to the spinal cord that occurred due to an injury or accident. It does not include disease-related deterioration. The symptoms will be different from sufferer to sufferer, and will range from paralysis to incontinence. Those suffering from a spinal cord injury could be still able to lead a normal life, whilst in more severe cases can have a complete loss of function in the spine. For more complete definitions please refer to the work done by the American Spinal Injury Association (below you can see how they classify these types of injuries. 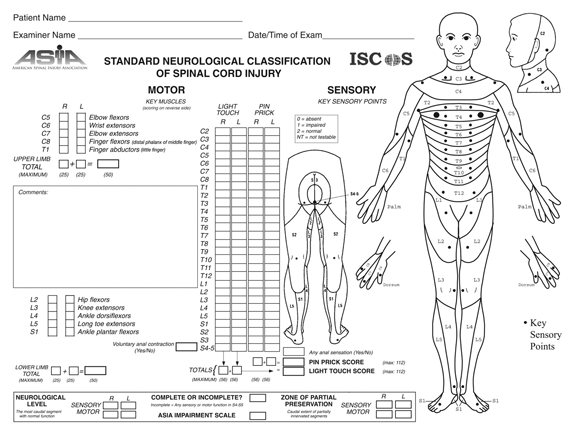 How the American Spinal Injury Association classify injuries for claims purposes. In terms of treatment, our spinal injury solicitors will arrange for excellent medical care and rehabilitation. Treatment types again can vary, but will typically include restraining of the spine, and methods in which to ensure that the inflammation can be controlled as painlessly and effectively as possible. Most forms of spinal injury will need a long rehabilitation period and physio. These will all be handled by your allotted spinal injury claims solicitor when we take charge of your spinal cord injury claim. We also help hundreds of people in the UK to make head injury claims. With nerve damage there can be a wide array of symptoms. Which ones you may have depends on the location and type of nerves that are affected. Damage can occur to nerves in your brain and spinal cord. It can also occur in the peripheral nerves, which are located throughout the rest of your body including the neck (we can also tell you how much for a neck injury compensation claim). What Are the Symptoms of Spinal Nerve Damage? Another spinal claim that we often get asked about is related to nerve damage. This is one of the most common spinal injury compensation claims that we process and help UK clients with. If you are suffering from any of the following symptoms, then you could be affected and might be able to make a claim with us. If you are suffering from any of these factors, then please seek medical attention for a professional diagnosis. We cannot offer medical advice over the telephone, but can act on your behalf for spinal injury claims once you have been completely assessed by a doctor or physician. We will endeavour to make sure that your rehabilitation is as quick and as comfortable as possible when recovering from spinal injuries. Our solicitors and lawyers will make sure that the relevant authorities get in touch with you during your recovery from spinal nerve damage, a spinal cord injury, or any other spinal-related injury that you have suffered. However, there are some websites which contain a wealth of information which you might like to look at during the recovery period.